The Stream is your hub to see what is going on within your project. It displays logged events from the space in chronological order, showing the date and time, author, tool, and action that took place. You can configure personal email notifications on certain Stream events from the Email Notifications tab within the Stream tool. Also, you can view Streams in an RSS Feed reader. The Stream only displays logged events that happened in the past 60 days. 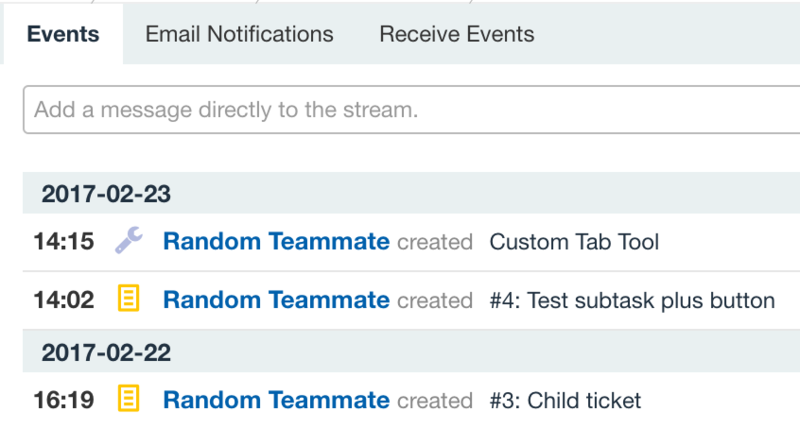 The Filter sidebar on the right is used to filter Stream events by date, event source, and/or user. If you want to see events from a certain tool click the Get link next to the tool name from the list in the Filter bar on the right. To pick multiple tools use the check boxes. To filter events by user, pick the user from the Filter By User drop down menu. You can receive email alerts on project events. By default email alerts are turned off for most events. You change this and configure your personal email alert settings from the Notifications tab within the Stream tool. Owners can set the default email notification settings in the project's Admin tab under Email Alert Settings. These settings will apply to new team members added to the project. However, user personal settings made in the Stream tool will override the Admin tab's Email Alert Settings. lower (Events happening in tickets you are following. By default you are a follower on tickets assigned to you. You would usually turn off email notifications for Tickets tools and turn on notifications for Follower, this way you get notified only on relevant tickets). Mentions (Notifications are sent out when you are mentioned or your group is mentioned in any of the project components. More information on mentioning groups here). Note that in your Stream tab you will only see sources for tools already installed in the project. For hourly, daily, and weekly summary frequencies, if no event happens during the interval no email is sent out. The default email notification frequency is "Never" for all events except for Follower and Mentions. You can explicitly opt out of receiving emails for bang mentions by removing the check mark from Receive emails for bang mentions. More information on bang mentions here. Project team members can insert a text messages in the Stream using the text field on the top to communicate with other members. This message will be visible in the Stream to all project members. This feature is only available in Pro/Private projects.